For over 30 years, Central File has been providing the rent-to-own industry with engaging, effective, direct mail marketing pieces. Using our years of industry experience and exclusive tracking programs, we are able to reach your target market, resulting in more new deliveries. Below are some common questions our clients typically ask. If you have any other questions or comments regarding our services, we welcome you to contact us! 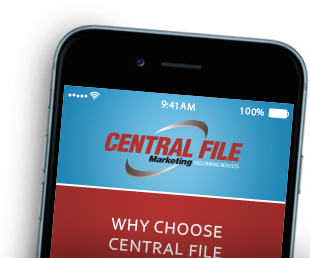 Contact the marketing professionals at Central File for a complete advertising solution. Can I keep my existing designs? Yes. Central File Marketing’s team can use your existing design to create a dynamic mailer, or we can work with you to create a new custom design. What products are available through rent-to-own? Everything from appliances such as refrigerators, washers and dryers to electronics like laptops and TVs to furniture and bedroom sets. How do you keep mailing lists current? We use comprehensive list appending and data segmentation, allowing us to target customers most likely to rent today. Yes! Our team of marketing professionals provide you with data analysis, creative designs, cost-effective printing and mailing services – all done in house! Do you follow up after a campaign? Yes we do. We provide you with a complete report which tracks your return on investment. We also contact your store on a regular basis to ensure everything is going well. Yes! Central File Marketing has invested in the best security measures, ensuring your customer’s information is protected. We have the best security in the rent-to-own marketing industry. From our secure perimeters to our impenetrable firewall and encryption methods, your data is in safe hands at Central File. TracBac is our exclusive technology which uses sales data to measure the success of each marketing campaign. TracBac allows us to show you the actual return on investment. How are the mailers delivered? We have our own delivery personnel. All your mailers will be delivered on time within budget.